Gustav became a named storm the morning of August 25, 2008, approximately 260 miles southeast of Port-au-Prince, Haiti and became a hurricane early on August 26, 2008. The National Hurricane Center forecasted that Gustav would become a major hurricane impacting the State of Louisiana with up to 20 feet of water in our coastal communities. Due to the uncertainty of the track, all coastal at risk parishes in Louisiana including the City of New Orleans planned and executed evacuations totaling close to 2 million residents. This is the first time in the State’s history the entire coast of Louisiana has been threatened requiring local officials to call for mandatory evacuations. On August 27, 2008, Governor Bobby Jindal issued a state-wide Declaration of Emergency in preparation for Hurricane Gustav. At approximately 1000 CDT on Monday, September 1, 2008 Hurricane Gustav made landfall as a category 2 hurricane at Cocodrie (Terrebonne Parish) with 110 mph winds. Major damage was caused by high winds, torrential rains and localized flooding from the coast through Central and North Louisiana. Power was lost to nearly 70% of the homes and businesses resulting in significant challenges to providing life support commodities across the State. Hurricane Ike formed the morning of September 1, 2008, approximately 1,470 miles east of the Windward Islands and became a hurricane late on September 3, 2008. The National Hurricane Center once again predicted a major hurricane would result in up to 20 feet of water in homes and businesses. Based on the forecasted path, coastal parishes in South central and Southwest Louisiana were particularly threatened and issued mandatory evacuations. On September 7, 2008, Governor Jindal issued a state-wide Declaration of Emergency in preparation for Hurricane Ike. At approximately 0210 CDT on Saturday, September 13, 2008, just 12 days after the State suffered a direct hit from Hurricane Gustav, Hurricane Ike made landfall at Galveston, Texas as a category 2 hurricane with 110 mph sustained winds impacting over 40 miles of Louisiana’s coast. Coastal parishes from Southeast to Southwest Louisiana experienced storm surge up to 20 feet and hurricane force winds from the Texas/Louisiana border to Morgan City (St. Martin/St. Mary Parishes). Major damage was caused by high winds, torrential rains and severe flooding. Power was lost to tens of thousands of additional households and businesses and the State assisted in evacuating citizens from Calcasieu and Vermilion Parishes. Thousands more self evacuated from the coastal areas. Although intensive planning and preparations followed as a result of the many lessons learned during the catastrophic storms of 2005, several challenges arose during the early stages of the evacuation in regards to emergency transportation and sheltering. 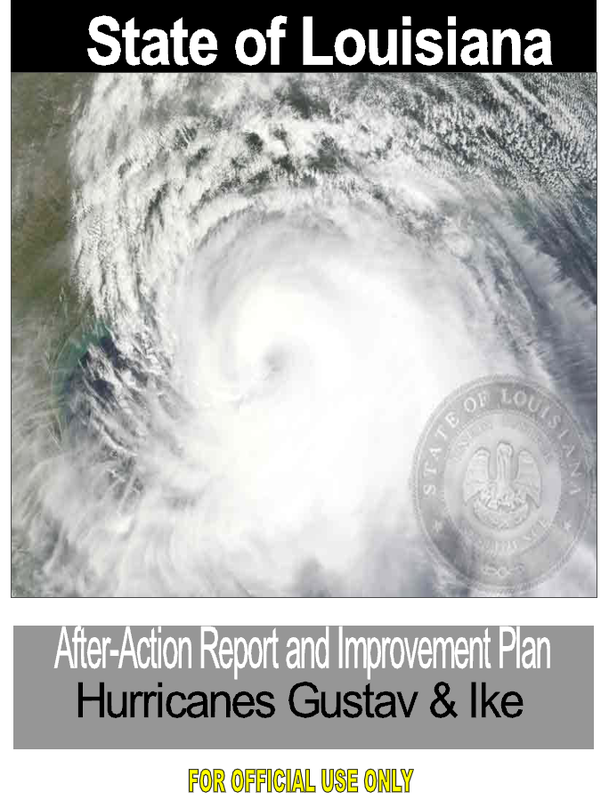 However, under the leadership of Governor Jindal, his staff, the Governor’s Office of Homeland Security and Emergency Preparedness (GOHSEP), and other state agencies, these obstacles were overcome with viable solutions resulting in the successful evacuation of nearly 2 million citizens from at-risk parishes during Hurricanes Gustav and Ike. Many firsts were achieved as a result of these efforts. Senior officials at both the State and Local levels have fostered a stronger relationship during the new administration, hence leading to a coordinated effort by all Parish, State, and Federal partners. These newly bolstered relationships were instrumental in the overall success of the evacuation that ultimately saved lives. It is also important to note the achievements of the Shelter Task Force that provided sheltering for over 45,000 citizens using local resources. Also, for the first time, sheltering states were invited to attend two sheltering summits hosted by Louisiana. While the recommendations from those reviews will be provided in a separate document, much of the discussions mirror challenges brought up in this report. Following this summit State partners met with the Joint Homeland Security Legislative Committee to discuss issues that need to be addressed, many of these issues were discussed in the State Shelter Summit. It is important to remember that as we move forward, the rest of the country is looking to Louisiana to solve the challenges and set standards for mass evacuation and sheltering. The 2008 hurricane season for Louisiana proved to be busy in ways paralleling the 2005 season with Hurricanes Katrina and Rita. This year however, unlike Katrina and Rita, the national attention was directed at how well the Federal, State, and Local partners were able to respond to the crisis and work hand in hand to mitigate the disaster. The improvements that were recommended and put in place following hurricanes Katrina and Rita were tested and in most cases proved a success. Despite success, plans are never “final” and will always require our vigilance to make them better and more efficient for the citizens we protect. There were many new strategies and best practices that were implemented during this hurricane season that should be mentioned. These programs and initiatives were accomplished on all levels of government, both State and Local Partners should be proud of the following as it represented the changes made under the new administration. • Get A Game Plan Campaign- PSA’s, Pre-hurricane season press conferences, use of agency websites to get out key information (with thousands of pre-storm hits). • Press Conferences- Governor and supporting agencies provided key information that led to the safe evacuation of over 2 million citizens from our coastline, and the sheltering and mass feeding that followed. • Information Technology- The use of Mystate Emergency Notification System, The Emergency Alert System (EAS), and other information sites to keep the citizens abreast of the events. • Mass Feeding- Establishment of Shelter mass feeding, use of PODs in affected areas, public and private partnerships that showed citizens helping each other. • Situational Awareness- Deployment of UCG cabinet members to Regions to gather on the ground situational awareness. • Unified Command Group- The Governor added key agencies, not normally part of the UCG, to assist in providing critical information on transportation, sheltering, mass feeding, FEMA, and weather information. • State EOC Controls- Placement of Legislative Liaisons in the EOC to help provide situational awareness to legislators. • Emergency Generators- Department of Natural Resources assisted in jump starting recovery by providing key infrastructure with power generation. • State Support Teams- Shelter support teams were sent to shelter locations outside of the state to assist with Louisiana evacuees. Above are some of the improvements that were successful during this storm season. It is important to acknowledge the significant strides in preparation, response, interoperability, communication, and collaborations between all Emergency Management Partners. GOHSEP conducted seven Regional After-Action Review (AAR) conferences to further improve the strides made in preparation of this hurricane season. Those conferences covered the warning, preparation, response, and post incident phases of Hurricanes Gustav and Ike. The conferences were designed to validate, consolidate and prioritize the issues, lessons learned, and best practices associated with the preparation for, response to, and recovery from the incidents. This After-Action Report does not attempt to capture every issue at every level of government. The focus is on those issues that can be addressed and corrected prior to the next hurricane season. While some issues could take longer than a year to address our goal is to correct those issues that impact the safety, health, and welfare of the citizens of Louisiana.